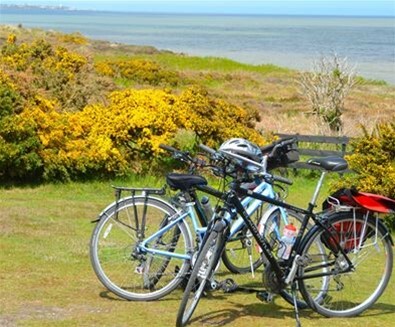 Local cyclist Stephen Squirrel and his wife Maggie have lived in Felixstowe for over 28 years and regularly head out on two wheels to explore our beautiful coastline. 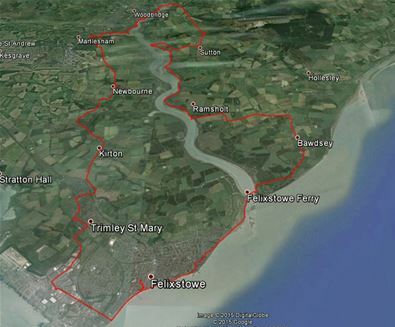 Stephen and Maggie set off on this two rivers route, from Felixstowe Ferry along the River Deben to Kings Fleet, across countryside to Levington marina, along the River Orwell and back home via a long section of tree lined paths to Trimley St Mary. 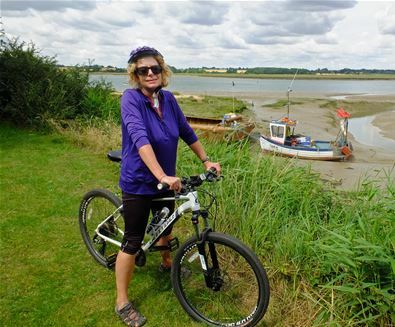 Stephen:We have wanted to do this bike ride for ages, but we needed light winds and thought some sun would be nice but not too hot and today looked a good bet. 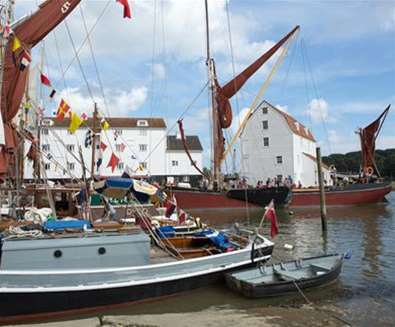 Our plan; to head down to Felixstowe Ferry cross the River Deben on the ferry, head to Woodbridge and then home. As the ferry doesn’t start until 9:30 we had time to do our exercises, have breakfast and pack a picnic. We were on the road at 9:40, a bit late but never mind. 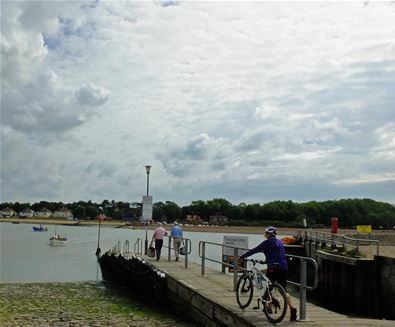 We start by heading down to the prom at the bottom of our road turn left and on to The Dip… We arrived at Felixstowe Ferry jetty just as the ferry was approaching; it’s a lovely but short trip across the River Deben to Bawdsey Quay, a single crossing for both of us with bikes costs us £7. 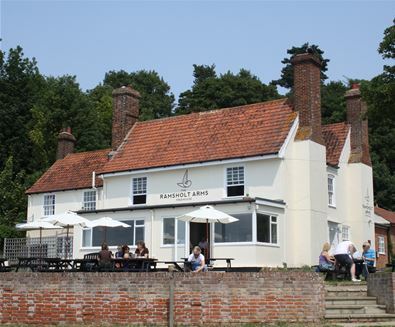 Then past the top camper parking places, on to Bawdsey village and then to Alderton where we turn left to pretty Ramsholt - a top spot for a pub! We have a short break here watching the boats go up and down even though the tide is low. 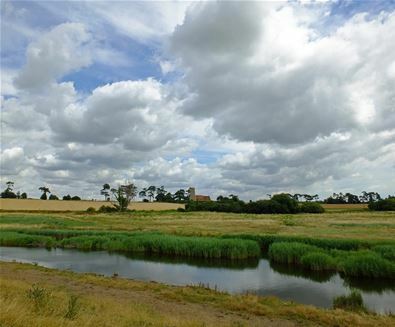 Then along the bumpy river path past Ramsholt church on the hill; this area is a haven for wildlife with the river and mud flats to the left and grassy meadows and waterways on the right, we have birds everywhere from Curlews to eEgrets, we see an artist sketching the cows (poor things are covered in flies) and a few walkers. Most of the path is flat but there are some ups and downs including some steps to negotiate! ‘The rocks’ is particularly beautiful and a popular spot for yachts to moor up, we stop and admire the view, with fishing boats in the mud and then a bright blue kingfisher flashes past. We have walked here in the past but turned off, inland then but this time we continued all the way to where it turns away from the river at Methersgate Quay. 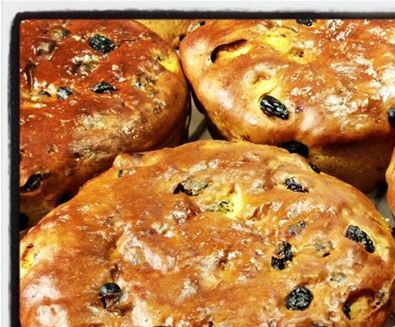 We follow the footpath through several gates and a field of potatoes and come across a narrow lane leading to Cliff Farm; we need a rest from bumpy paths and head along the lane – a private road – coming out on the main road at Sutton. Getting tired now we look for somewhere to have our lunch and stop at the picnic spot at Sutton Heath where we find a nice wooden bench. After our sandwiches, we lay in the grass to doze and read for an hour before continuing along the busy Woodbridge Road to Wilford bridge. 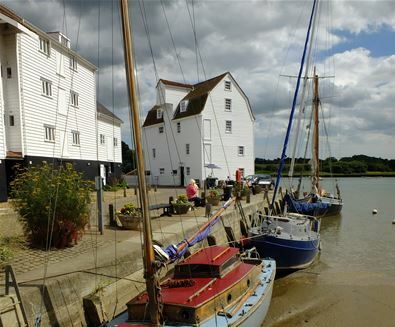 We turn left along the lovely Woodbridge river path, passing loads of house-boats and marinas to the outstanding Tide Mill where we stop to buy a bottle of water and an ice cream. 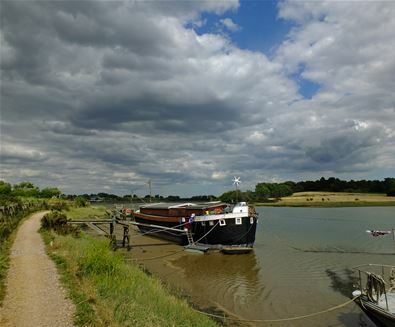 The path here, in the middle of Woodbridge, is busy with people enjoying the scene; loads of yachts, youngsters crabbing and loads of muddy swans being fed bread, we even stop to watch a crane lift a small boat into the river! 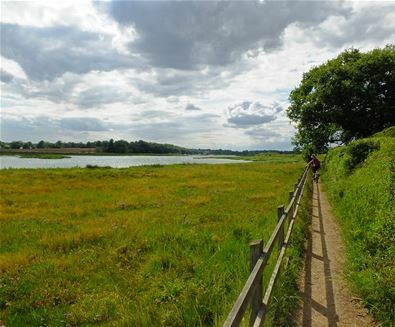 We continue along the river path to Kyson Point, then head up Martlesham Creek for the final section along the back lanes to Felixstowe. Passing Waldringfield, Newbourne, Kirton and we reach Trimley, Mag continues along the main road back home, while I turn off toward Cordy’s Lane past the docks to the seafront, along the prom and home! 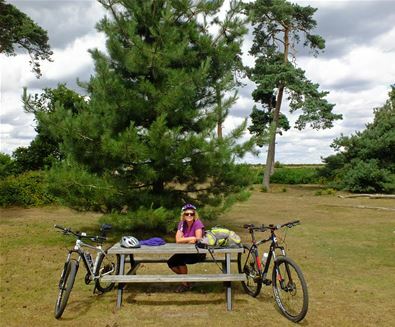 What a top day savouring all the best that The Suffolk Coast has to offer. We covered 35 miles and were out for seven and a half hours, it was good to get in the shower and have salmon for tea!